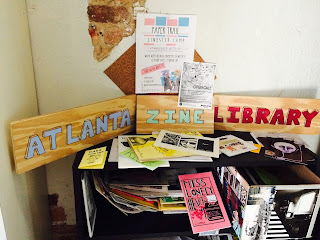 Lime Green Giraffe staff members met on Saturday June 27th to prepare for the LGG booth at the Atlanta Zine Fest. The staff created two zines plus an amazing new marketing poster. The Atlanta Zine Fest is an event to celebrate DIY media and art as well as writers and community activists. Syndie and Edie build Q&A, our interview zine. Avery, Meghan, Lillabeth and Emma work on Our Words, our creative writing zine. The marketing team Autumn and Nia, led by Jacqueline, pose with our new poster!